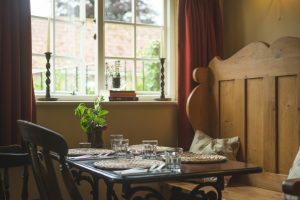 All hail to this most delectable country pub in the heart of Ye Olde Greate Bedwyne, a picture perfect village in North Wilts. 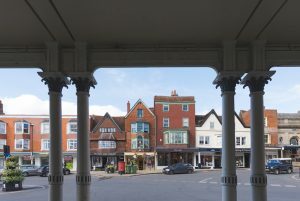 Mere miles from Marlborough, Great Bedwyn boasts the remains of several crusaders and a prestigious memorial to Sir John Seymour, father of King Henry VIII’s third wife Jane Seymour, but there’s nothing old or fusty or, frankly, medieval about this scrummy gaff. 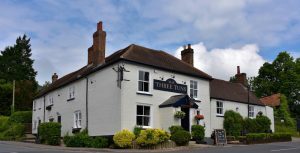 The Three Tuns is one of those rare beauties – its lovely summer garden and toasty fires make for year-round curb appeal, it is positioned perfectly for a walking/shopping/exploring day out, and, more than anything, the food is to die for. This pub is so special that it needed owners James and Ashley (young and funky with three kids; James was a chef at Scott’s in Mayfair, Rivington Mix Shoreditch and then my old local the Anglesey Arms in Shepherd’s Bush before heading westwards) to spend three years searching for it. In fact, they nearly gave up and bought a farm shop instead but thank the lord they didn’t, because The Three Tuns is a magical sparkling gem. 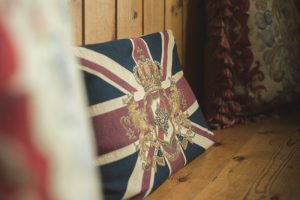 Having gutted the place and started from scratch, the decor is cosy yet chic, with stripped wooden floors, leather sofas, rugs, fresh flowers and plenty of nooks and crannies. And you know how we love nooks and crannies at Muddy. A fab beer garden out back (unusual for a centre-of-the-village pub) is dog-friendly and has a boules pitch for summer-tastic drinking. OK, the real reason why I’d come here again is the food. It was seriously good, and I don’t say that lightly. In fact, I have to ‘fess up that I can’t even post the photo of the nibbles we shared (melt-in-your-mouth Lomo with Fried Salted Almonds) or my starter (Wild Boar Scotch Egg, Celeriac Remoulade and Pork Scratchings) ‘cos I scoffed the lot before remembering about the camera. Oops. And apologies. But it was just too good! 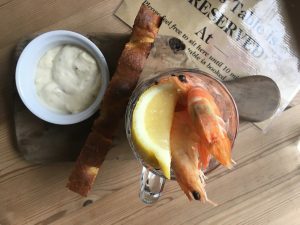 My friend went for 1/2 Pint of Prawns with the most delicious Aioli. 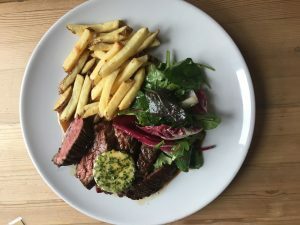 For the main event she plumped for 8oz Rare Bavette Steak with Parsley & Garlic Butter, Chips and Salad. She chowed the lot, although she told me repeatedly that she’d skipped breakfast and burned off a gazillion calories this morning on the treadmill just so she could stuff herself today. I tried to pretend I was unimpressed and then proceeded to kick her under the table after every mention but she didn’t seem to get the hint. 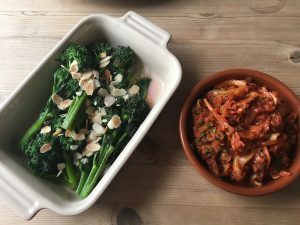 Sides (which come in at no more than a super-value £4) were Purple Sprouting Broccoli with Toasted Almonds – always a fave of mine – and Kimchi, which is a little bit too cool for school for me but my friend told me it’s good for the gut and proceeded to finish the bowl. 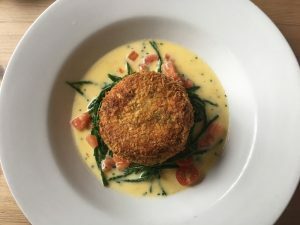 Good food is at the very heart of The Three Tuns (they’ve won accolades for Best Sunday Roast EVER and Favourite Local Pub, so it’s no surprise that great food is a biggie), clearly produced with great care and energy by chef/owner James. 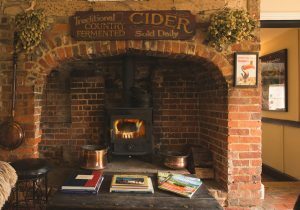 The menu changes on a daily basis and features local, in season produce (very Muddy, thank you very much). Almost everything you will eat here is made fresh in-house, including the breads, hand-cut chips, ice-creams and all the accompaniments. 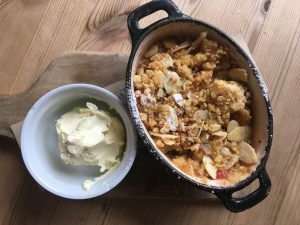 There is also a Blackboard Bar Menu which features small bites, a kids’ menu and the obligatory Sunday Lunch. Quirky touches include the jug of freshly-made Bloody Mary propped on the bar, small batch spirits from around the Southwest and homemade Mulled Cider. NEW for 2019 is an exciting Spring/Summer wine list, with a focus on sourcing the best by-the-glass options. 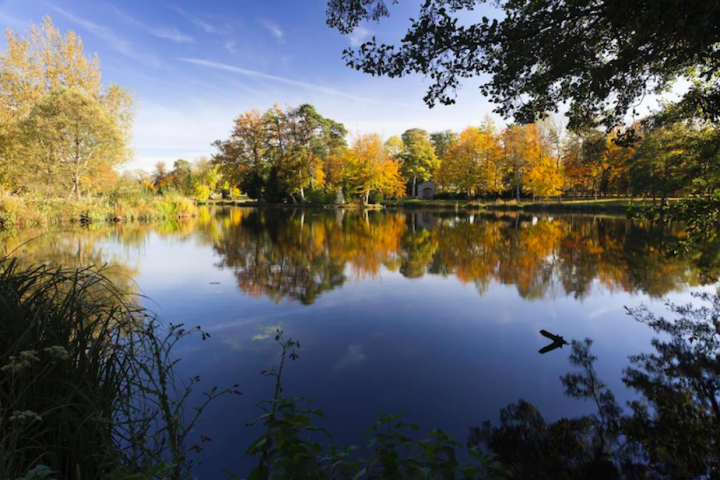 They now stock wines from A’Becketts vineyard near Devizes – true pioneers in the English wine industry, plus they are super affordable, which we like to hear. 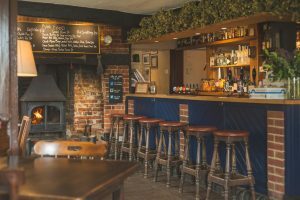 For beers, check out the new offerings from Otter Brewery, Ramsbury, Flack Manor and Bath Ales, though they are always introducing new products too. Heard of Genie? The Three Tuns are one of the first pubs in the country to sell this new range of soft drinks, made with delicious live and fermented gut-loving active cultures (! ), with no added sugar, scary sweeteners or artificial ingredients. 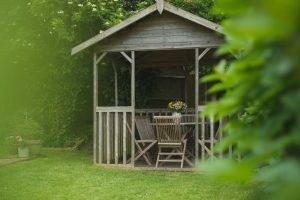 Watch this space for an overhaul of their garden and outdoor areas this summer, too! It’s a big Muddy tick from us. 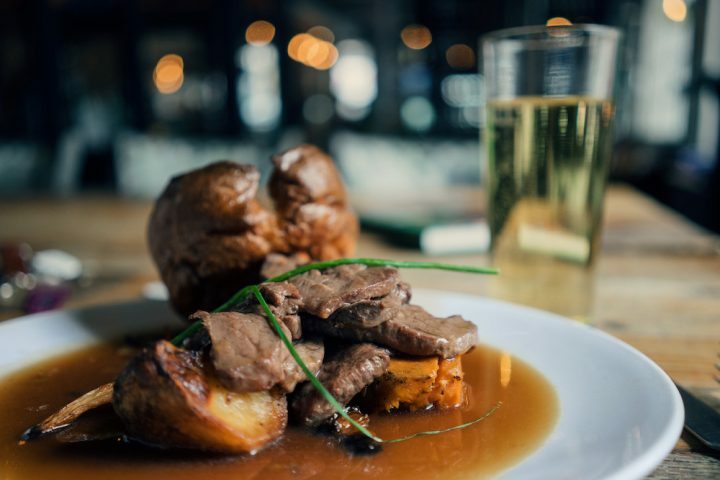 Good for: Sunday lunch (in fact, any lunch), tip-top food you don’t normally find in a local pub, and a young, relaxed ambiance. Foodies will be in seventh heaven and whoever is paying won’t be too unhappy either. A big fat Muddy tick from us. Not for: Don’t know, really. It’s a great pub/restaurant in a great location. Nothing to complain about here. ££: Excellent value. Nibbles from £3 (I’m coming back to try out the Baby Bangers, please), starters around £7/8, mains from £13 (only the Bavette Steak took us over £17), sides £3-£4, and puds from £3.